I’m very glad to see some coverage of Dave Wilson that includes relevant information about who he is. Narrow-minded bigot. Homophobic hate-meister. Political mischief-maker. Given all the unkind labels Dave Wilson has incurred over the years, I wasn’t sure what kind of ghoul I’d encounter when I called Friday to talk about Wilson’s latest stunt: tricking voters in a predominantly black district into electing an old, bald, white guy to represent them on the Houston Community College Board of Trustees. To my surprise, Wilson, the businessman, conservative activist and frequent candidate, was cordial, down-to-earth and, well, nice. Misguided, maybe. Obsessive, maybe. Prone to bomb-throwing, name-calling, and other fifth-grade pastimes, maybe. At times he seems kind of like a kid in a political control room, pushing all the buttons to see what works. His goals are noble, though, for the troubled HCC board in desperate need of watchdog. Wilson wants to root out corruption and seek an independent audit of finances. I want to believe he’d do what he says. Trickery aside, there’s something honest about him. “I think they’re not satisfied until they completely have everybody indoctrinated and everybody’s homosexual,” he said. Wilson also isn’t opposed to hiring gays or lesbians. Just ask 28-year-old truck driver Katherine Giadrosich who has nothing but good things to say about her new boss. Then there’s this – Wilson, the notorious warrior against “the homosexual agenda,” casually mentioned in our phone interview he’s considering proposing an anti-discrimination ordinance at HCC that would include protections for gays. It was a suggestion by his campaign adviser. I was speechless. This is a guy who led the charge in 2001 to amend the City Charter to prohibit employees’ unmarried domestic partners – gay and straight – from receiving employment benefits. No, actually. Not at all. And neither do most voters. Kudos to Falkenberg for such an interesting and provocative piece. I have quite a few things to say about it. 1. It’s nice that Wilson behaves more tolerantly to people he’s connected to than to everybody else. It doesn’t change my basic impression of him, however. Besides being non-representative of his district politically and racially, Wilson also joins the ranks of conservative neophytes elected to political bodies they openly despise. At a tea party event in October of last year, Wilson delivered a 76-slide presentation on why voters should reject the $425 million bond proposal to fund HCC, the gist of which was that enrollment was down and money is expensive. Despite his heroic PowerPoint, that bond passed. In 2011, Wilson sued the HCC trustees to prevent the purchase of land Wilson claimed was overpriced. The suit was summarily dismissed with prejudice and Wilson had to pay court costs. That’s the first I’d heard of that particular lawsuit; clearly, there are still plenty of aspects of Wilson’s past actions to uncover. But if that paragraph where all I knew about Dave Wilson, I would know that I would not want him on the Board of Trustees. 3. Wilson’s claims about wanting to be a “watchdog” that roots out corruption on the HCC Board are completely undermined by his support of Yolanda Navarro Flores, the least ethical member of the current Board. If one truly wanted to clean up the HCC Board, one would have opposed Yolanda Navarro Flores in November, and one would now be supporting Zeph Capo in the runoff. But Wilson is incapable of doing that because he is so blinkered by his homophobia. This is a clear demonstration of how Wilson’s personal opinions can and will lead him astray on other matters as well. The first thing the campaign did was a radio spot, Carroll Robinson, sent his friend over to consult with Dave Wilson. Together they developed the radio spot that is immediately below. Lol. Why am I the person running everybody’s campaign? 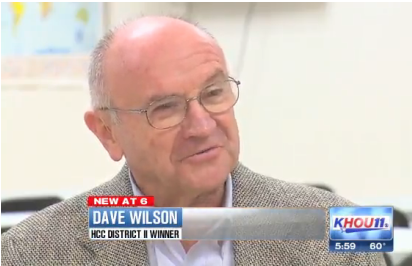 I have known Dave Wilson since my City Hall days like all of us who are politically active do. I did not “send” anyone to run his campaign. Let me be clear I did not tell Dave Wilson to do any such thing. More importantly, how could a 24 year incumbent be so out of contact with his district that Dave Wilson of all people could beat him? I enjoy politics and talk to a lot of people like you do but I don’t control what they do with their campaign. I did not develop the radio spot and I did not develop any mail. I find it interesting that I am now advising everybody’s campaign. If I was advising Dave he would have won by more than 26 votes. There’s a certain amount of wiggle room in Robinson’s statement, but at the least it suggests that Wilson’s unnamed campaign manager’s claim is overblown. 5. It also raises a question: Why is Wilson’s “consultant and strategist” unnamed in the article he wrote? If whoever he is did work for the Wilson campaign, it should be a matter of public record because Wilson would have to disclose it in his campaign finance reports, either as a payment to him or as an in-kind donation. The same would be true for any “friend of Carroll Robinson” that worked with him to develop a radio spot. Wilson’s finance reports do nothing to clarify this. His 30 Day report lists an expenditure to a “First Tuesday Campaign Group” in Jackson, MS, with the description “Radio”, but the only First Tuesday Campaign Group I can find in Google is based in Chicago and only lists Chicago-area clients. Googling the street address in Jackson suggests it is an apartment complex. He also listed an expenditure for Smart Consulting Firm in Houston, but the only relevant result I could find was for an engineering consulting firm. His eight day report yields no further clues. Again, for a guy who claims to be a champion of ethics and transparency, his finance reports are a mystery and he has an anonymous campaign consultant making claims about assistance from another HCC Trustee that that Trustee denies. All due respect here, but tell me again why I should put aside my animus towards him for his repellent views and give him a chance now that he’s finally managed to get himself elected to something? 6. Let’s put aside all of the questions about Wilson’s honesty and ethics for a second. The bottom line is simply this: Can one overlook his history of homophobia and anti-gay activism and simply evaluate him on the policy merits as a candidate for HCC Trustee? Can one separate the public hater from the public official who might have some worthwhile policy positions for the job? Maybe you can, but I can’t, at least not without him acknowledging the harm that his longtime advocacy has caused and the wrongness of his beliefs about LGBT people. To do so, in my view, normalizes his hateful and retrogressive beliefs in the same way that formerly radical beliefs have become increasingly normalized in the Republican Party. Even if there were evidence to suggest he might be a competent Trustee, I would not accept him as legitimate in the absence of any renunciation of past beliefs. He hasn’t earned that and he doesn’t deserve it. Dave Wilson’s interview with Falkenberg in the Chronicle and with Chris Cuomo on CNN show a guy trying to distance himself from himself. At one point in the Cuomo interview he said he was trying to “confuse” the voter then he corrected himself and stated ” no not confuse , but refocus on the issues”. Wilson is a Trojan horse. I have served on a similar board and with a guy very much like Wilson. They say they support public education…..but they are about undermining the organization they are elected to oversee. Charles, you make the case vs Dave Wilson. Falkenberg and Cuomo will not need to wait long to discover the real DW. Ross – No, that was just a typo. I’ll leave the Freudian analysis for the audience to handle. 🙂 Thanks for the catch, it’s fixed now. Kuffner you are good at name calling, please tell us why Yolanda Navarro Flores is the least ethical person on the board. I can prove you wrong. Wilson as Flores were against the bonds because they were sold because enrollment was increasing, busting at the seams, almost at 100,000 according to people like Carroll Robinson and organizations like the Chronicle. What they were pushing was a flat out lie. Even the Chronicle has finally admitted that enrollment is declining. Wilson sued the district once because they were trying to purchase a piece of land at four times market value. Take a trip out of the Yuppie area and go look at the land that HCC purchased on Westheimer. Go look at the O’Quinn building that they purchased that your buddy Richard Schechter stated was being used as classroom (he misspoke). Millions of dollars sitting there not even a warehouse at the moment. I guess wasting taxpayers money is okay with people like you. Talk about lack of ethics Capo took an all expense trip with Marshall and Boris Miles to Costa Rica. The union for which he works, top level executive, using Gayle Fallon’s son for law work, almost half a million dollars. There are quite a few other things on Capo’s resume that need telling. You are into name calling and do not do research or you are incapable of doing good research, so you rely on opinions that are not based on facts. Dave Wilson does speak out against the homosexual lifestyle he has every right to do so. And Christphobes (people like you that do not believe in Christ or the word of God) are entitled to your opinion. But I dare you find one piece of literature written by Dave Wilson where he resorts to name calling. He is a much better person than you will ever be or hope to be. If knowing who did the strategy for Mr. Wilson go no further, it was me. By the way ask Carroll if he knows Justin Jordan that is name of the person that helped Dave Wilson. Jordan also did some work for Flores. Read do research and maybe one day your eyes will open up and not be clouded with bigotry. There is a lot more history to Dave Wilson than the Falkenburg interview reported. My first memory of him politically was when he pointed out a conflict of interest by Council Member Peavy who owned lucrative contracts at the city airports under the minority enterprise program. The Council Member quit council rather than give up those contracts. He later sought the District A seat and was narrowly defeated by Bruce Tatro. I got to admit this discussion is getting good. Manuel Barrera is two bit writer behind the insidehccs.com website. He has been after many HCC employees over the years and spread lies about them on behalf of Yolanda Navarro Flores. Chief Communication Officer of HCC filed a complaint against Yolanda Navarro Flores and Herlinda Garcia for improper use of HCC resources to further their campaign – in July 2013 (Records filed). Then Manuel Barrera posted lies about Mr. Dan A to try to get him fired. Mr. Kuffner need to look further into this website that he now changed the name. If Dave Wilson’s name is on this website, then there is further conflict of interest. We have invoices paid to Manuel Barrera by the Communications Department over the years at the intimidations by Yolanda Navarro Flores. The Spangler administration stopped this unethical and illegal practice in 2010. That was when Manuel started to smearing campaigns because he was unable to illegally earn 30k a year of hard earned tax payer’s money. The Communications office can provide all information. Please post us an email address so we can send to you. If I spread any lies they are welcome to sue me. The fact is I have published information that HCC has sent via Open Records request. Whoever Dan is an outright liar. I have had contracts in the past with HCC but they did not come about because of Yolanda Navarro Flores. But having contracts with HCC is not illegal, or unethical. If I did not perform the work for which I was hired let the person step fourth and prove it. Dan which contract are you referring to? I have never earned $30,000 a year with HCC. Dan is a liar. Spangler did not stop the practice that is another lie. Provide the information Dan. The forum in here. The only contract where I may have had the potential to make $30,000 a year was with Yaffee/Deutser but I only worked with them a few months. Dan prove it. While you are at it how about publishing your name and address. Smearing campaign, I guess you mean the publishing of Inside HCCS. Again what is a lie that is presently on Inside HCCS. The fact remains that Kuffner does not know what he is talking about. Unlike Trustee Flores I am not afraid of bullies or corrupt lazy employees who get promoted by kissing behinds. I intend to be there today at the meeting when they announce the election results. So Dan come up and introduce yourself. Your statements have reached the point of ridiculousness. Do you wake up in the morning spitting hate? Tell me what I have done at HCC that is unethical, then provide the evidence you have and give me the opportunity to prove you’re wrong. Someone is now stating that the Chief Communications Officer of HCC filed a complaint against in July 2013. News to me! Let me quote the Chief Communications Officer’s most recent email to me of two days ago: “Anything for a woman on the move. Lol.” Does this sound like someone who’s filed a complaint against me? Mr. Kuffner, I do not normally read your blog, however, as I’ve learned of your continued unfounded allegations, I decided to briefly respond and to inform you that I said a prayer for you today. One more thing whoever published the information, I have not had phone number for a while, so brace yourself for a possible lawsuit by the person who now owns that number. I understand that a certain employees has been emailing the information to other employees who misuse HCC credit cards. It seems that HCC will not be canvassing the results today, it will be on Monday, so I will see you Dan on Monday. I await the proof of the $30,000 I earned one year. Even better, Dan, write a check for the difference between what I actually earned and what you claim. For Inti where on Inside HCCS do I reference Mr. Dan A and the July 2013 complaint? I don’t recall writing about the instance that you mentioned, in fact the July 2013 complaint is news to me and to Trustee Flores. I have been unable to get in touch with Ms. Garcia to see if she knew anything about it. But since it is in the records send to Inside HCCS, info@insidehccs.com let me look at them. Some stray thoughts about voter confusion: Two others linked to the Dave Wilson story in various ways have also benefitted from voter confusion about their identity. Kevin Hoffman shares the same name as a prominent black politician, but was emphatic to include his own (white) photo on campaign materials. Carroll Robinson was widely confused with the widow of the late Judson Robinson, and benefited from the respect citywide for the Robinson name. David Robinson may be receiving some benefit even now from that surname. Why is Kuffner scared to respond to these posts by Barrera and Flores? Come on Charles, you’re good at throwing out accusations, at least be man enough to respond. Also, many in the community say your breath is horrible and you have food in your teeth often. At least stay away from people’s faces if you don’t brush your damn teeth. Mighty brave of you there, Mister Anonymous Internet Commenter. I didn’t respond to them for two reasons. One, I’ve said my piece, and I thought Barrera and Flores deserved a chance to respond on their own terms. And two, what exactly was there for me to respond to? Denials and unsourced accusations don’t amount to much, unless you think it would have added value for me to be all “Did too!” in the comments. I will give credit where credit is due; Charles at least HAS a forum for comments to be posted. Last time I checked, Yolanda has not paid her debt to HCC. I did not perform a bivariate ecological regression, but a quick check of the results in the Wilson-Austin contest does show a slight racial divide, with Wilson winning more Anglo precincts near Scarbrough High school (505, 270, 576) but also carrying Independence Heights (192, 195), while Austin fared better in Acres Homes and Fifth Ward areas (138, 202, 265, 296, 585, 611).